START WINNING BOWLING WITH HYPNOSIS! Improve your abilities with an effective secret weapon: Hypnosis! It's easier than you think. Imagine having the power to be as successful as you've dreamed!!! Have no time to "spare" working on your bowling score? Hypnosis is the answer to improving your bowling game and you can do it in a way that won't take up any time during your busy day. Hypnosis is done just as you drift off to sleep. So instead of reading or watching television, you can be listening to a self-hypnosis program that will make good use of the brief time between awake and asleep. In bowling there is a combination of using the right ball, developing your form, and staying focused. Hypnosis can help with at least the last two parts. Because hypnosis helps you envision yourself in a winning situation, you will be able to recreate that perfect form each frame you bowl. Hypnosis is best if it takes place right before going to sleep. This is a time when most people can generally relax and be uninterrupted. The program will begin by bringing you to a completely relaxed state that is deepened to the point where there is at least some blocking of external stimuli and you can be completely focused on the voice of the hypnotherapist. Once you have entered a deep state of relaxation, the hypnosis process goes to the script stage. It is here that desired behaviors and outcomes are introduced and reinforced. Messages affirming such truths as "you will have confidence, perfect form, concentration, etc," are all parts of the script that may be spoken in order to bring about changes in your actions once you are brought out of the hypnotic state. Dr. Steve G. Jones M.Ed. 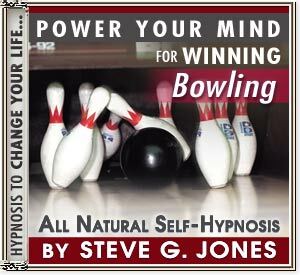 is a clinical hypnotherapist who has developed a program called "Wining Bowling." Here, a script is devised specifically for improving bowling skills and confidence. It will lead the listener to develop their own winning strategy and carry it out.